So I’m about to hit you with the most amazing Sunday dinner roast ever. Yes, it is pricey, but it is so worth it. This is my husband’s favorite meal, and pretty much the only thing that he requests on a regular basis. He claims it actually makes him emotional, it’s that good. As long as you buy a good cut of meat, your work is pretty much done. You just cover it in a little rub, let it roast away, then whip up a quick gravy using the drippings. We are talking out-of-this-world flavor. Although working with a cut of meat that is on the pricey end can be intimidating (you don’t want to mess it up! ), I’ve made this at least 5 times, and it’s always come out perfectly, except for the one time that I tried to use a less expensive cut. Still good, but not as amazing as usual. Trust me – splurge a little for a special dinner! Adapted from The Winemaker Cooks —-> One of my favorite cookbooks! Stay tuned for another great recipe from here this week. 1 standing beef rib roast, 4-5 lbs. Remove roast from fridge at least 1 hour before cooking, to allow it to come to room temp. In a small bowl, combine rosemary, pepper, salt, and oil to make a paste, then rub all over roast, including rib side. 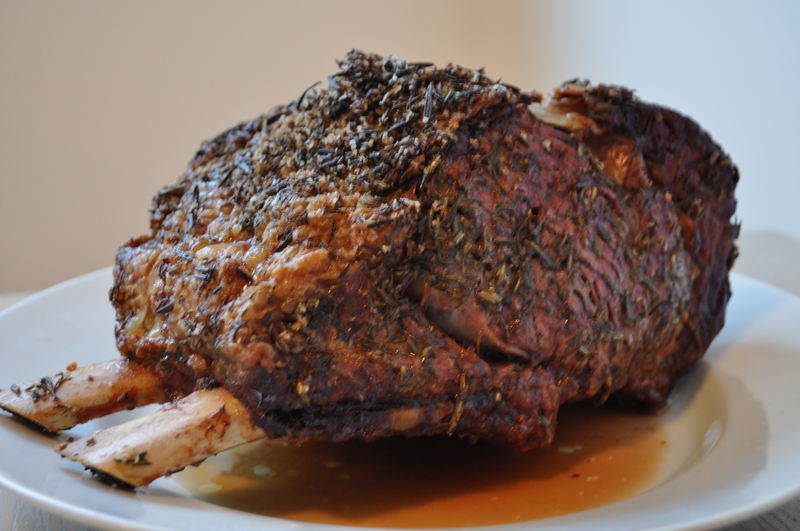 Place roast, bone side down, on a rack in a roasting pan. Roast for 45 minutes, then turn temp down to 375°F and cook until meat reaches an internal temperature of 125°F (thermometer inserted into center of meat), which will take another 30-45 minutes. I like to use this thermometer. Meat will be medium rare, but will continue to cook while it rests – don’t overcook! Place roast on a carving board and tent with foil for 20 minutes before slicing. Pour drippings from the roasting pan through a fine mesh strainer into a glass bowl, them skim off fat and keep to the side. Place roasting pan over 2 burners set on medium heat, then add wine and stocking, scrapping up all the brown bits at the bottom. Pour this wine/stock mixture through the same strainer into the glass bowl with the drippings (minus the fat). Place pan back on 2 burners over medium-low heat, add butter, 1/4 cup of the reserved fat, and onions and cook until onions are lightly brown, about 15 minutes. Sprinkle flour into pan and cook, whisking constantly, for 3 minutes. Add the drippings/wine mixture and cook, whisking constantly, for 5 more minutes or until thickened. Serve alongside or atop slices of roast (my husband actually freezes any extra gravy, and will have a whole meal of just gravy and rice). Posted in Dinner, Recipes and tagged meat, Prime Rib, roast, rosemary, standing rib roast, Sunday dinner, the winemaker cooks. Bookmark the permalink. This dish is my favorite meal out of many of Ashley’s great recipes. The first time I had it I couldn’t believe we were sitting in our kitchen and not a five star restaurant.